The value of pipe #129 is n/a points. Chicagoland Pipe and Cigar Club held its annual Show April 23-25, 1999 and I was delighted to attend. One of the dealers there, Jim Tedesco, had a large selection of pyrolytic graphite pipes. They had been so well cleaned and reconditioned that they looked like new. We hemmed and hawed and dickered. Finally, I got about 30 pipes from him. This is one of them. It stayed in the collection for several years, but I finally got an example the had never been smoked and still had the literature with it. So this very rare pipe is now on the Pipes for Sale page. It is perfect in every respect. 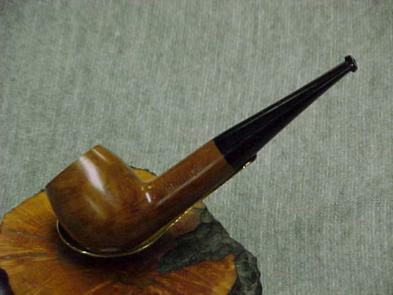 Bert Bruning of Palm Desert Tobacconist sold me over 20 pipes from his shop and, after keeping an Imported Briar Billiard and trying it, had a case of seller's remorse and wanted to buy back his Apple like this one. Since the pipe he sold me was un-smoked and came with literature, it had become the exemplar in my collection and I was loath to part with it. We made a deal for him to buy this one instead of the other. Now we are both happy.